Editor’s Note: This article no longer contains the most recent information or proposed rates. Please see this May 7, 2018 article for the latest information. 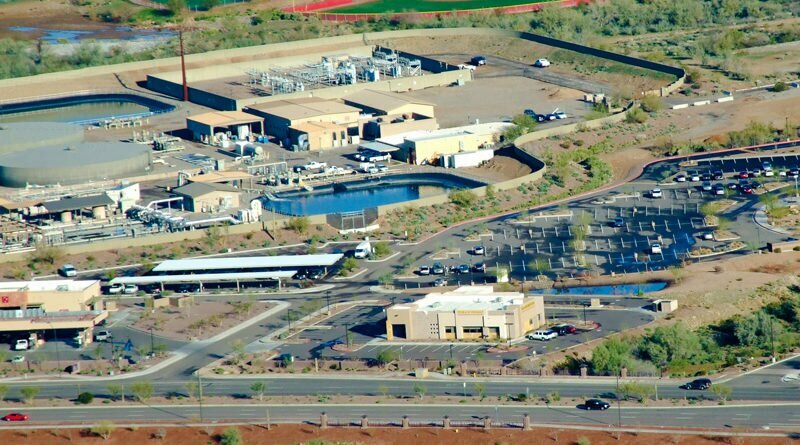 The water utility serving Anthem’s east side aims to consolidate its 11 Arizona districts and create a new rate structure that would spike rates for the average Anthem customer 42 percent in the first year then drop each of the next four years, ultimately to a level roughly 12 percent below today’s rates. 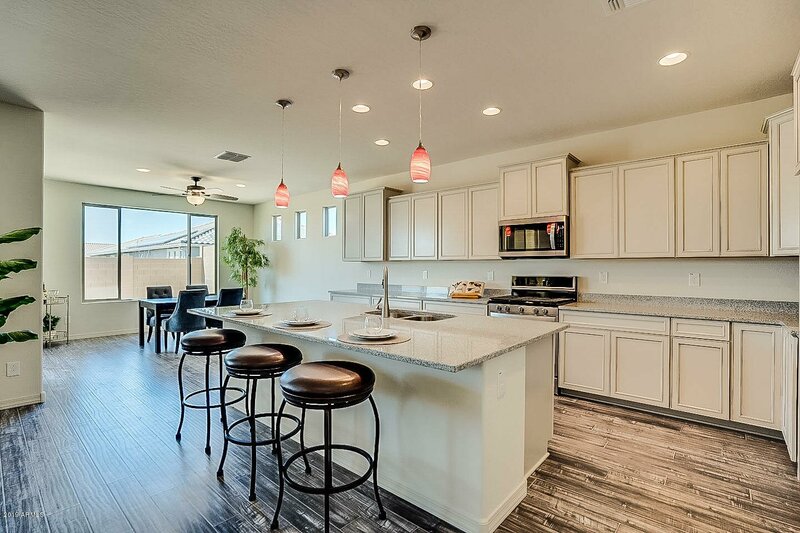 If the districts stay separate, EPCOR proposes that Anthem residents pay a “stand-alone rate” that would be even higher—a 52 percent increase that would begin in the first year and remain indefinitely, and in the future could go up further. “We are very much in favor of consolidation,” Roger Willis, president of the Anthem Community Council, said in an interview. 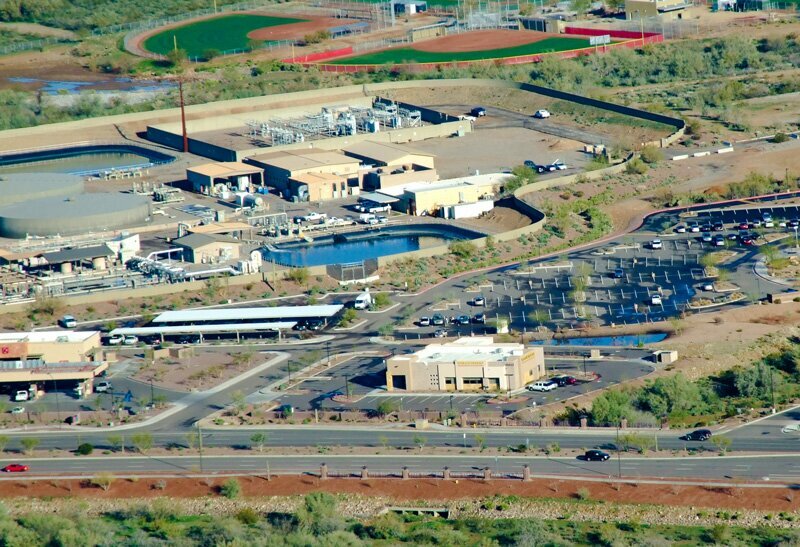 Council voted at its Oct. 25 board meeting to intervene in EPCOR’s rate case, which is subject to approval by the Arizona Corporation Commission. Intervention allows the council, likely along with ratepayer representatives from other districts, to weigh in formally with objections and evidence. EPCOR will hold a public meeting in Anthem Nov. 6 to explain the proposal and process and answer questions [details at the bottom of this article]. Anthem is not the only EPCOR district with a lot at stake. Customers in Sun City would see rates more than double over the five-year period under the consolidation proposal. In all, EPCOR is looking to generate an additional $21.5 million per year over the next five years — for a total of 107.6 million — to deal with increased operating costs and capital expenditures. “Anthem customers will benefit from consolidation,” EPCOR spokesperson Rebecca Stenholm said in a phone interview. That’s true in relation to the proposed cost increases for other districts, and it’s true in the long run (from the fifth year onward). 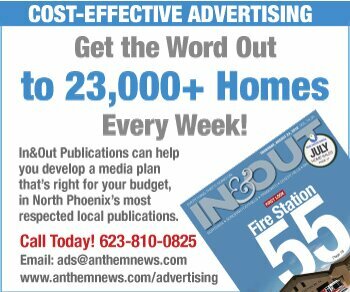 But the consolidation proposal would mean an additional $2.7 million in revenue from Anthem customers during the five-year phase-in period, according to calculations done by EPCOR for North Phoenix News. 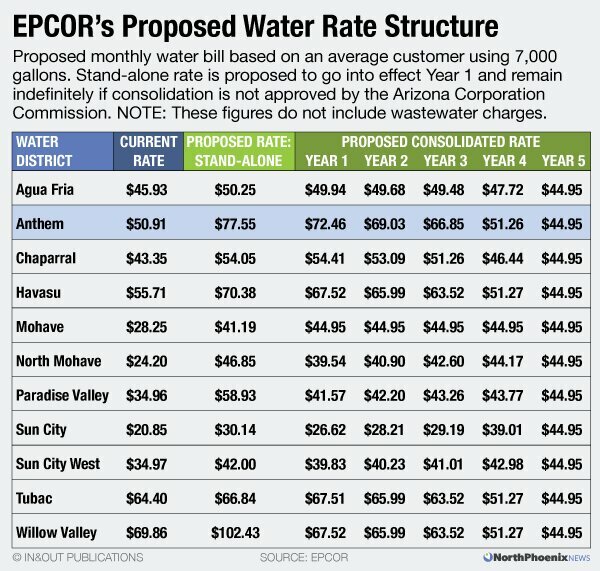 Under the proposed stand-alone rates—should the state’s decision go that route—EPCOR would seek to extract an additional $20.3 million from Anthem customers over the five years. The proposal is separate from EPCOR’s consolidation of five wastewater districts, a plan that was approved by the Corporation Commission in June. In that merging of wastewater service areas, the utility said the average Anthem customer’s wastewater portion of the bill would drop by about 35 percent. The new water-district consolidation proposal was requested by the state’s Corporation Commission. EPCOR plans a public meeting in Anthem Monday, Nov. 6 to explain the proposal and answer questions [details below]. The Corporation Commission will hear the case in May 2018 and will ultimately determine whether EPCOR should consolidate water districts or continue operating them independently, and what the rates will be. If settled on the expected timeline, the new rates could go into effect in late 2018. EPCOR presents its proposal in this second public meeting on the topic held in Anthem. Residents can also submit comments by mailing a letter referencing Docket No. WS-01303A-17-0257 to the following address, or by visiting www.azcc.gov and clicking on “I want to” and “submit a public comment”.